GridKa School takes place roughly 10km outside of Karlsruhe. We strongly recommend that you book a hotel near the Karlsruhe city center or main station. From there, you can reach the school venue with our dedicated bus shuttle or public transport. Karlsruhe is easily reachable by car or train, and well connected to Frankfurt International Airport. Frankfurt International Airport (FRA) offers many connections by plane. From the colocated train station Frankfurt(Main) Flugh it takes about 1 hour to reach Karlsruhe main station by train. Karlsruhe HBF (main station) is situated close to the school hotel and Karlsruhe downtown. Deutsche Bahn offers fast connections from nearby airports, other German cities, as well as international connections from France, Switzerland and other countries. Karlsruhe is well connected to the German autobahn. Please plan your route as required. Note: Karlsruhe downtown is currently undergoing major construction work. Make sure to consult up to date maps, and check with your hotel for adequate parking opportunities. GridKa School 2018 takes place at the FTU right outside KIT Campus North. Situated 12km outside of Karlsruhe, we recommend taking our Shuttle Bus from Karlsruhe. GridKa School organises a dedicated shuttle bus between Karlsruhe downtown and the FTU. The shuttle departs every morning near the recommended Hotel Leonardo, and after the Workshops/Evening Lecture near FTU. You can reach KIT Campus North by bus from either the nearby villages or KIT Campus South. Note: Do not travel directly with the Tram S1/S11 to Campus North! It arrives at a side-entrance that requires a special KIT Card to enter. Karlsruhe is well suited to getting around on foot and via public transport. Several public WiFi access points allow short-term planning via the the public "KA-WLAN" and eduroam. 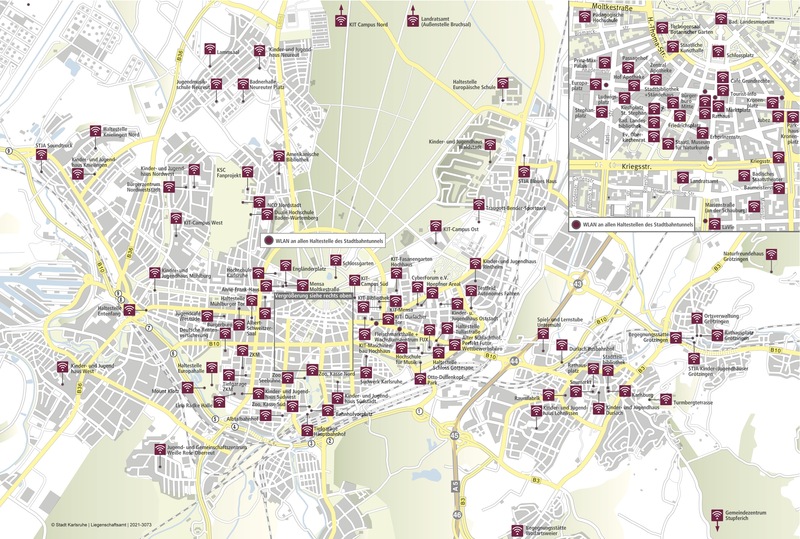 Karlsruhe has a well established public transport system, spanning Karlsruhe downtown itself and all suburbs. The KVV operates all trams and buses, and offers day tickets as well as single- and multi-use tickets. Single-use, multi-use and day tickets can be bought at the red-and-white vending machines on tram stations. Ticket shops are available in front of Karlsruhe main station and market place. Note: Tickets are priced according to the area they cover, corresponding to zones. Travelling inside Karlsruhe requires a ticket for 2 zones, and travelling from Karlsruhe to the school venue requires a ticket for 3 zones. You can plan your trip with KVV with the Journey Planner or public transport apps. Note: Construction work in Karlsruhe during the GridKa School week affects the route of trams and buses. Please plan your trips for the correct date. The tram and bus network plan (German) is also available on tram stations and bus stops.